Phuket's glory is its magnificent coastline. Beaches range from gentle crescents of white sand with calm waters to rocky headlands pounded by raging surf. Secluded coves lie hidden among densely forested headlands tumbling around white beaches. In several such places, visitors can feel years away from civilization. Phuket's Indian Ocean coastline boasts the finest beaches while the eastern coastline overlooks some 30 lesser islands occupying largely tranquil seas. Islands vary greatly size, some are large enough to sustain fishing communities, coconut plantations, deer and wild boar. Others are little larger than massive rocks. Others again resemble fortresses, are riddled with caves containing the birds' nests prized by gourmets. The pine-lined Mai Khao Beach (34 kilometers from town) is Phuket's longest beach, site between November and February each year, where gigantic sea turtle struggle ashore to lay theirs eggs. Nai Yang Beach, to the south (30 kilometers from town) forms part of National Park and is peaceful, excellent for swimming and relaxation. Inland from Nai Yang Beach is Wat Phra Thong where a famous partially-buried Buddha is enshrined. Further east, (20 kilometers from town), the beautiful Ton Sai Waterfall Forest Park and Khao Phra Thaeo Wildlife Park have innumerable birds, wild boars and monkeys to enliven botanical beauty cooled by sonorous cascades. Further south, Pansea Bay, Surin Beach (24 kilometers from town), Sing Cape and Kamala Beach unfold in rapid succession. A public 9-hole golf course fronts Surin Beach where swimming is not recommended due to powerful surf and a treacherous undertow. The northern end of Kamala Beach is suitable for swimming. Patong Beach (20 kilometers from town) is Phuket's most developed beach. Cabin and bungalow complexes, hotels, bars, nightclubs, discotheques, shop and restaurants front the crescent bay. Windsurfing, snorkeling, sailing, sunbathing and swimming number among major activities. 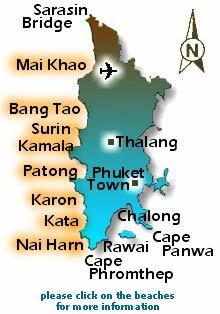 Karon (20 kilometers from town) and Kata (17 kilometers from town) are the next major beaches. Both are long, largely peaceful and eminently suitable for swimming, windsurfing, sailing, snorkeling and sunbathing. Kata is partially fronted by Club Mediterranean Complex. Nearing Phuket's southernmost point, the white Nai Harn Beach (18 kilometers from town) fronts a shallow lagoon between steep headlands. Swimming, windsurfing, sailing, sunbathing and snorkeling are popular activities. The nearby Promthep Cape marks Phuket's southernmost point is the perfect place from which to view spectacular sunsets. To the east, the palm-fringed Rawai Beach (17 kilometers from town) hosts Phuket's best known 'sea gypsies'. several offshore islands have gleaming white beaches, and dazzling underwater scenery that attracts dedicated fishermen and scuba-divers. To the northeast, Chalong Bay (11 kilometers from town) extends in a broad sweep and, a few kilometers inland, Wat Chalong enshrines statues of Luang Pho Chaem and Luang Pho Chuang, Phuket's most revered monks. Finally, on the southernmost tip of Phanwa Cape (10 kilometers from town) is a Marine Biological Research Center and Phuket's Aquarium which displays several hundred exotic, grotesque and flamboyantly colorful marine species found mostly in Phuket's teeming waters.